According to the drug's Ireland-based manufacturer, Alkermes, the number of people nationally using the drug has more than tripled over the past four years, to 111,500 in 2018. An injectable medicine that helps people addicted to opioids get clean is gaining in popularity as an alternative to methadone, and Long Islanders who used it say it stopped their opioid cravings and allowed them to rebuild their lives. Addiction specialists say the medication, Vivitrol, is effective for some people in recovery when combined with counseling — but they warn it is not for everyone. Methadone or a third anti-opioid-addiction medication, buprenorphine, may be better for others, said Jeffrey Steigman, chief administrative officer of the Huntington-based Family Service League, which offers addiction treatment. Nationally, the number of people receiving Vivitrol more than tripled over the past four years, from 36,600 in 2014 to 111,500 in 2018, according to data from the drug’s Ireland-based manufacturer, Alkermes. The rise of Vivitrol, brand name for an injectable version of the drug naltrexone that received federal approval to treat opioid addiction in 2010, occurs amid an epidemic that has killed more than 3,700 Long Islanders since 2010. A report released March 20 by the National Academies of Science, Engineering and Medicine says naltrexone, methadone and buprenorphine can “save lives." Yet, the report says, only a fraction of the more than 2 million Americans with opioid-use disorder receive medication for it. One reason some have resisted methadone and buprenorphine — often sold under the brand name Suboxone — is that, unlike Vivitrol, they are opioid-based. Self-help groups Narcotics Anonymous and Alcoholics Anonymous — despite the name, many people with opioid addictions attend AA meetings — traditionally have shunned any medication-based treatments for addiction, believing that taking them means “I’m still using,” said Robert Savino, clinical director of the addictions program for South Shore Child Guidance Center in Freeport, which treats adults and teenagers for opioid addiction. Attitudes are starting to shift, Steigman said. Some in AA and NA are more open to Vivitrol than methadone or Suboxone because it is not opioid-based and does not cause dependence, he said. Studies show that those who use medication to kick an opioid addiction are more likely to stay clean than those who do not, he said. Medication is important because “our clients have a disease that has affected their brains,” said David Flomenhaft, director of the outpatient behavioral health center of Mercy Medical Center in Garden City. Still, at a Vivitrol support group meeting Tuesday in a Levittown church, one woman said that initially, because of AA, she thought medications were “a crutch” — until she relapsed and later turned to Vivitrol. Another woman said her NA group discouraged use of anti-addiction medications. Jonathan Ackerman, 45, said after the meeting that he began receiving Vivitrol injections after more than a month in a recovery center in 2017. 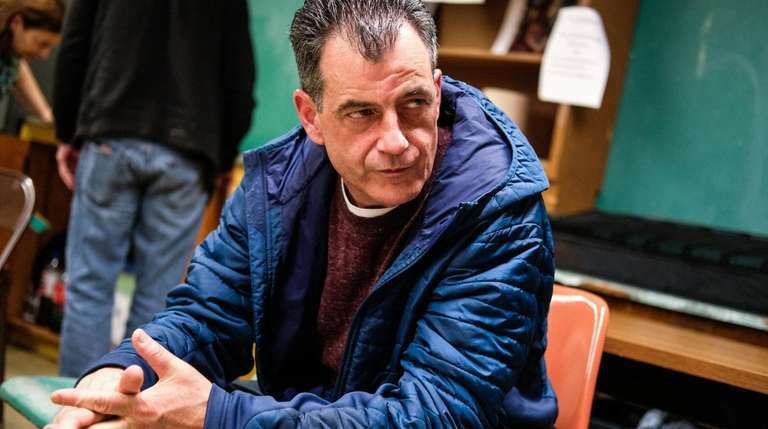 The Seaford man’s struggle with addiction began with alcohol when he was a teenager. Ackerman then turned to opioid-based painkillers like Percocet and OxyContin “not realizing two pills a day would turn into 20 and then heroin and rehab and on and on and on,” he said. He had relapsed during a previous attempt at recovery, so he was given a Vivitrol injection upon release from treatment in 2017. He said he was on Vivitrol for more than a year and has remained clean for the first time in his adult life. Vivitrol is the most expensive of the three treatments — $1,300 per month “wholesale,” although almost no one pays that amount because of Medicaid, Medicare, private insurance and an Alkermes financial-assistance program, a company spokeswoman said. Vivitrol is still less commonly used than the most traditional medication, methadone, which was approved to treat opioid addiction in 1972. More than 380,000 people were on methadone treatment in 2017, according to a survey by the federal Substance Abuse and Mental Health Services Administration. Methadone is distributed only in federally approved centers. Vivitrol and Suboxone can be prescribed by authorized doctors. Suboxone can be taken home. Vivitrol is injected by a medical professional. The convenience of Vivitrol is one of its appeals. Initially, methadone clients must travel to a methadone facility every day to receive treatment. Suboxone must be taken daily — although a longer-lasting injectable version of buprenorphine was approved in late 2017. Vivitrol is typically injected only every 28 days, making it more likely the client actually will receive the medication, said Dr. Karl Dormesy, medical director of Mercy’s behavioral health center. Yet with less-frequent contact with medical professionals, people on Vivitrol may be less likely to attend counseling sessions, Young said. The lack of opioids in Vivitrol is both a pro and a con. The body's tolerance level for opioids falls when a recovering addict is on Vivitrol, said Dr. Marc Larochelle, an expert on addiction medicine at Boston Medical Center. That means the same amount of heroin may cause a fatal overdose after Vivitrol treatment, but not for someone who relapses while taking methadone or buprenorphine, because there already are opioids in the body, he said. Larochelle was lead researcher on a 2018 study published in the Annals of Internal Medicine that found survivors of opioid overdoses who later used naltrexone were more likely to die of an overdose than those who entered methadone or buprenorphine treatment. Larochelle cautioned that the sample size of naltrexone users was too small to make definitive conclusions, and more research is necessary. But he said the data indicates that naltrexone may be most appropriate for people who have been off opioids for a while but still get cravings. Another issue with Vivitrol is that users cannot start treatment until seven to 10 days after they are off opioids. A study published in 2017 in The Lancet comparing Vivitrol and Suboxone found that more than a quarter of those assigned to the Vivitrol test group never began using the drug. “Vivitrol’s tougher to start” because of the difficulty in getting past the detox stage, said Dr. Joshua Lee, lead researcher of the study and an associate professor of population health and medicine at New York University. Suboxone, in turn, is commonly used as part of detox. Once treatment began, Vivitrol and Suboxone had similar success in keeping people from relapsing, he said. Some object to the aggressive marketing of Vivitrol. Several 2017 media investigations concluded that Alkermes exaggerated Vivitrol’s benefits in comparison to its competitors. Alkermes said in a statement that “our marketing practices are ethical, legal and appropriate." The manufacturer of Suboxone, Virginia-based Indivior Inc., is facing its own problems. A federal grand jury Tuesday indicted Indivior Inc. and British-based Indivior PLC on fraud charges for allegedly telling doctors and Medicaid officials that Suboxone is safer and less susceptible to abuse than other opioid treatments, including generic forms of buprenorphine. Naltrexone, also known under the brand name Vivitrol, approved in a long-lasting injectable form in 2010, binds to the opioid receptors in the brain and blocks opioids like heroin from getting users high. The FDA approved its use in treating alcohol addiction in 2006. Buprenorphine, authorized in 2002, is an opioid that acts like other opioids, like heroin or OxyContin. But it produces either no high or a much weaker high. Under the brand name Suboxone, it is combined with the anti-overdose drug Naloxone, often sold under the brand name NARCAN. Methadone, approved in 1972, is an opioid that produces either no high or only a slight high, when used as directed. It is still the most commonly used medical treatment against opioid addiction. Recovering drug addict: 'I was a complete terror'"I thought I could just do these pills for fun," said Margaret Luchesse, 29, a Seaford resident. "I didn't think I had an addictive personality."